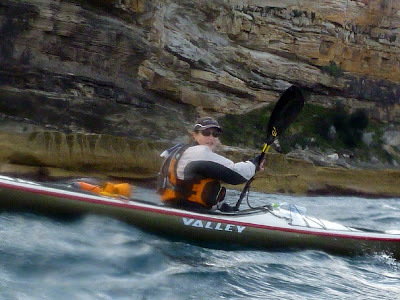 The Balanced Boater: Bass Strait: First Woman Solo Crossing. Bass Strait: First Woman Solo Crossing. It was great to receive one last update text from Shaan Gresser on Friday the 25th February to confirm that she had safely arrived at Little Musselroe Bay and in so doing, became the first woman to kayak across Bass Strait single handed. Last year when we discussed her preparation for the solo trip I asked her whether it might be a "first". She just shrugged her shoulders and made it obvious that this was not even part of her motivation for making the crossing. For Shaan, the freedom of travelling on her own and the opportunity to explore the wild and beautiful Islands of Eastern Bass Strait were the key attractions. Shaan rightly recognised the precarious nature of solo paddling and set out to make herself as safe and self sufficient as possible through solid training, good technique and detailed research of the Straits. Although lacking the brute strength of some other paddlers, Shaan made up for it with fitness and attitude. In the months leading up to the crossing her increase in speed had many wondering what was driving her and now they know! Shaan's success is a reminder of what we can acheive if we commit ourselves to a challenge and keep a clear sight of our goals. Her trip should inspire many of her peers who have the ability and the desire. I am sure many will ask themselves why they shouldn't be next and hopefully they will pull out the maps and start planning.